Do you like sister stories? 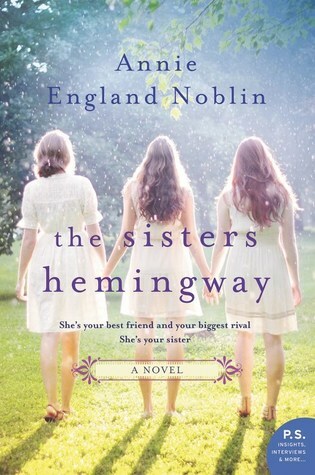 Goodreads: The Sisters Hemingway: they couldn’t be more different…or more alike. The Hemingway Sisters of Cold River, Missouri are local legends. Raised by a mother obsessed with Ernest Hemingway, they were named after the author’s four wives—Hadley, Pfeiffer, Martha, and Mary. The sisters couldn’t be more different—or more alike. Now they’re back in town, reunited to repair their fractured relationships. Hadley is the poised, polished wife of a senator. Pfeiffer is a successful New York book editor. Martha has skyrocketed to Nashville stardom. They each have a secret—a marriage on the rocks, a job lost, a stint in rehab…and they haven’t been together in years. Together, they must stay in their childhood home, faced with a puzzle that may affect all their futures. As they learn the truth of what happened to their mother—and their youngest sister, Mary—they rekindle the bonds they had as children, bonds that have long seemed broken. With the help of neighbors, friends, love interests old and new—and one endearing and determined Basset Hound—the Sisters Hemingway learn that he happiness that has appeared so elusive may be right here at home, waiting to be claimed. Thank you Amelia from William Morrow Paperbacks.